So I've put the Curses / Perl 5 stuff on hold for now while I work on a new secret project. I've been busy doing C++ and Qt stuff, making a nice GUI app to help people make remixes of their favourite Minecraft texture packs. I started this around the new year, and was racing to get something done before the Minecraft 1.5 release. Well, so much for that! The thing with the Minecraft 1.5 release is that it splits the terrain and items sheets up into individual files, which are generally easier for people to work with. In fact, pretty much as soon as I had the idea to make this tool, Mojang announced they'd be changing how texture packs work to make things easier for users. Damn their black hearts! Anyway, I think my tool still has a lot of potential to reduce the headache of merging bits of texture packs together and generally tweaking things. Certainly there's a few extra features on my to-do list now: the new version supports animations for everything, so that'll be a fun feature to work on. Here's a screenshot of my not-yet ready alpha version. Dokucraft is on the left, and the default Minecraft on the right, but you could load any number of packs and arrange them how you please. 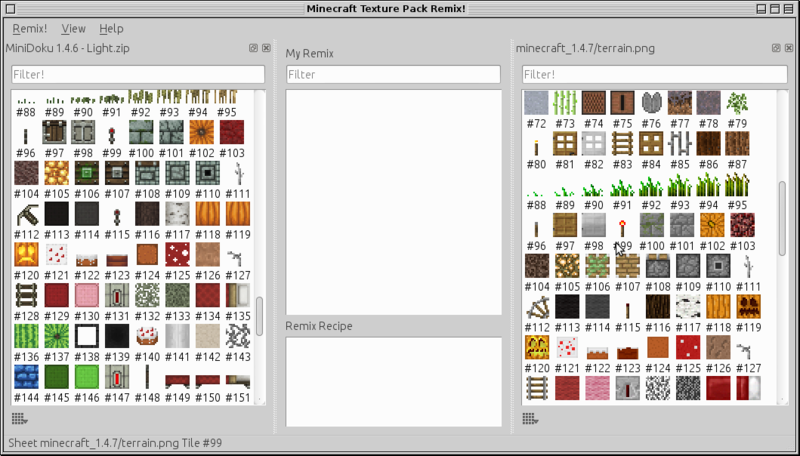 The central area is where you'll be able to drag and drop tiles into to create your own custom pack, and the program will remember the steps you took to make it simpler when Minecraft and the texture packs inevitably get updates. There's still much to do of course, but I've finally got most of the "infrastructure" code out of the way that I'm happy enough with it to show people. If you've got some special workflow or tweak that you like to apply to your Minecraft texture packs, leave a comment!